6:00 am: Check maternity group to make sure no births during the night. All are resting. Naomi and Dove chewing their cud. Over two weeks past due dates for both. No indications of births going on from them. 6:30 am: Check on maternity group and offer some alfalfa to all. Naomi and Dove enjoy their alfalfa. Windsong and Dulcie scarf theirs down. Sweet Bell stays in shelter. Not interested in alfalfa. Hmmm, not like her turn down an extra treat. 7:00 am: Let out maternity group to big pasture. Meander out calmly visiting others in middle pastures as they head out for the day of grazing. Bell and Lucky Charm first ones wanting out. No signs from my imminently due alpacas of wanting to go into labor. Go back to house and do computer work. 8:00 am: Notice Sweet Bell laying down not grazing much. Others grazing away. 9:00: Bell up going potty and laying right back down. Windsong was two weeks early having her baby. Haven't noticed Bell grazing much. Better start watching her more. Her energy seems off to me. Better go out and start chores in case baby comes today. Want raking done before I'm too tuckered out if birth happens. 9:30 Get barn area cleaned. Notice Bell up to potty again but lays down. Text Ann down the road, could be Bell is in labor. My nearest alpaca neighbor and I try and be at each others births. Try and give Ann as much heads up that labor maybe happening so she can get her chores worked and let out her herd. 9:45: Bell up and potties but then goes and lays back down. Rubbing her head on ground before trying to go potty. Noticed the previous two dams doing same thing when in labor. Getting more sure we are in labor. Continue with chores. Text Ann again and say pretty sure we are in labor. 10:00: Need to empty wheelbarrow but see Bell up again to go potty. Progress is moving more quickly. Debate on emptying wheelbarrow or get my gear ready. See Bell pushing. Leave wheelbarrow and get birth kit and head to house to make "dipping sauce" for cria's umbilicus. Call Ann. She is on her way to my farm. Definite labor! Remember to bring towels and dipping sauce and stop by bathroom myself. 10:05: Get call from neighbor. Is animal in labor? Yes! Come watch. Grab dipping sauce and head out. Get to barn area. Darn. Forgot towels. Run back to house. Grab towels. Get to barn. Darn! Forgot to go to bathroom. Set towels down by dipping sauce. Watch Bell. Back laying down. Have time to run to bathroom. 10:07 Grab kit, towels and dipping sauce and start to head out to observe Bell in big field. Ann arrives. Wait for Ann. Bell up and going to potty again pushing. Walk out slowly to field keeping good distance. Darn. Forgot binoculars. Oh well. More pushing. See nose coming out. 10:15 Nose and toes. Stay about 50 feet away. Bell comes over and sniffs Ann who is kneeling. Uh oh. Need help Bell? Noes and toes are out. Wait a bit to see what happens before seeing if something stuck. Moose with us. Bell wants him away. Shoo Moose back. Minds. What a good dog. 10:20 No progress. Still observing. Bell walks some. Lucky Charm and Naomi greet baby's face. Miss Marple comes over and sniffs baby too. Dove walks far away and doesn't want to watch. Good Lucky Charm watching. Maiden. Needs to learn. 10:25. Still no progress. Start to worry. Should have had more progress by now. Talk it over with Ann. Bell eating grass. Give it a few more minutes. 10:27: Still no progress. Go up behind Bell and hold feet. Wait for push. Hard push. Hold legs don't let legs go back in. Little more legs come out. Baby and Bell now grunting with pressure of pushing. Hard push. Hold legs. More leg comes. Hard push. Almost got shoulders. Another hard push shoulders out! Good girl Bell! Lays down. One more push. Get rest of baby out. It's a girl!!!!! Looks rose gray or multi. HOORAY!!!!! Got what I hoped for. Peel a little membrane off away from nose and face. Baby squirming. Good sign. Take dipping sauce and dip umbilicus. 10:30. Step back and let Bell and baby bond. Darn. Forgot camera. All is good for now. Run to house to get camera. Ann watches baby. Baby sternal. Yay! Take pics as baby tries for first stand. Cute. Long legs. Gets it after few tries. Good girl! Others come to greet new arrival. Kismet is very nosy. Kismet too nosy. Interfering with baby and mom. Shoo her away. 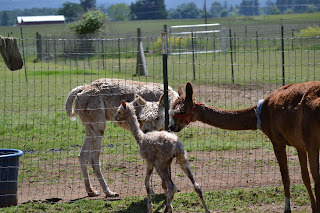 Take mom and baby to barn area so baby can figure out how to get milk. Bell a little confused and loses baby I'm holding. Set baby down. Still confused. Halter up mom. Lead mom in with baby to bond. Bell passes placenta. healthy looking. Give Bell Banamine shot. Hard delivery. Give Bell some alfalfa and pellets. Eats some. Not humming much yet. Get baby under Bell. Several attempts finally get her to nurse. Hour after birth. Not bad. Good latching on. Mom standing still. Whew. Relief on getting nursing started. Ann heads home. All looks good. Watch mom and baby nurse again. Hungry. Go in for lunch. Check mom and baby. Baby resting nicely. Eat lunch. Better go out and finish chores. Baby looks too limp. Rush over to her. Way too limp. Rouse her awake. Go nurse baby. Mom kicks baby off. Darn. What's wrong? Try again. No go. Baby having hard time standing. Call Ann. Help! Need milk to supplement. She has will bring it over. Hurry. Baby crashing on me. Grab kit and Jump Start. Get some energy in kid fast. Get some in mouth. Baby falls down. Can't stay up. Neck arching. Call Ann. Hurry. Ann arrives. Run to house get milk heated in bottle. Run back. Try giving baby little bottle. Not much in. Ann holds Bell. Try getting baby under her. Kicks off. Fights us. Try and milk her out. Fights harder. Have sedative shot. Run to house. Give sedative to Bell. Try more bottle on baby. Bell's eyes drooping and see her weaving bit. Try again putting baby under her. Kicks off and fights us. Damn it! Call local Vet. Dr. Pete can be here 45 minutes. Keep trying bottle. Ann suggests maybe merconium is stopped up. Do I have enima? Run to house. No mineral spirits but put a little warm water in. Run back. Give to baby. She tries to get up to go but too weak to stand. Straining. Holding her in cush position. Baby can't stay in cushed position on her own. Flops over and neck arches. Hold neck and keep massaging energy in. Feel her cramping and massage her back and tush. Calm self and try doing energy. Holding down my panic. Hard to do energy in panic mode. Holding baby. Neck arching. Supporting her and sending energy in her. Please hang in there baby. Maybe take temp? Run to barn. Get thermometer. Take temp. 100.1. Normal range. Hard strain and gush of poo matter comes out. Thermometer in tush helped get things passed. Baby stands up. Eyes look brighter. Still wobbly but looking better. Holy cow that was it! Stuffed bottom. Still weak. No milk for couple of hours. Need nourishment in her. Dr. Pete said give syringe of Karo Syrup. Run to house and get syrup. Try little more bottle. Baby lays down but can hold a cush on her own. Better sign. Dr. Pete gives another sedative to Bell after exam. Milk in sac but stress keeping her from dropping milk down. Very little coming out. Wait a few minutes to see if sedative takes hold. Try putting baby under. Nothing. Wait a bit longer and baby tries again on her own and success! Yeah! Not much in Bell so try and give more bottle to baby. Bell still not happy and kicks off baby after Dr. Pete leaves. Not sure what else to do. Dr. Pat calls confirming appointment for next day. Inform him of day's events. Maybe bring some of others in. Stress might be because of Bell's rejection of baby. Needs her buddies in with her. Such a balancing act of not having interference and distraction to bond with mom and baby and keeping the from being stressed. Bring Dulcie and Miss Marple in. Works. Bell calmer and letting baby nurse more. Sit down. Need to cry. Carrie and Carol arrive to see new baby. Tell them day's events. Help watch over baby. Visit with them and observe. Bring others in to be with Bell. Almost time to feed. Morgan comes over and finishes my chores. Thank goodness for finding high school kid to help with chores sometimes. Carrie and Carol leave. Feed pellets to gang. Start noting how often other moms nurse babies. Baby needs to be encouraged and help to find mom but once finding mom is good to nurse on her own. Bell standing better for baby but walks away from her after nursing. Watches baby but doesn't make baby stay near her and doesn't feel the need to stay near baby. Bit of a concern over the bonding still. Still not sure how much milk baby is getting. Only short sips so far. Baby fighting me harder when I try and give bottle. Good sign getting stronger. Finish feeding and baby goes to mom. Latches on good. Nurses two minutes. Wonderful! Go in and get something to eat. Bring out to barn and eat watching baby and mom. Resting. Get up in about an hour and needs help finding mom who stepped away. Point baby in right direction and baby nurses. About two minutes again. Go in and shower. Feel better after shower. About an hour since last feeding. Go outside. Dark now. Sit in chair and observe resting packies. Baby and Bell cushed outside shelter. Double jacket seems to be keeping baby warm. Windsong and little boy get up to nurse. Dulcie and baby get up to nurse. Bell stands up. Baby stays down. Go over and make baby get up. Baby needs help finding mom again. Point her in direction of mom. Goes right under mom and nurses two minutes. Go inside. Check computer work and decompress some. Go out in hour. Baby and Bell moved under tree. Cushed. Sit on park bench. Exhausted. Lay down on park bench. Doze off. Hear Windsong and baby boy nurse. Sit up. Bell gets up. Wait. Baby not up. Walk over to her. She stands on her own and needs just a little nudge from me to find mom. Good two minutes of nursing. Go inside and sleep in bed. Get up in two hours and check on them. Bell gets up when sees me. Baby wakes up. Stands up on own and finds mom without me. What a relief. Go back to bed. Check on them in two hours. Same. Baby looking much better. Regular morning check. Mom and baby up and nursing on own. Baby finishes nursing and says good morning to Miss Marple. "Wanna play?" Off they go to the races! Most beautiful sight to see. Dr. Pat comes for well baby checks. Does IgG on baby. Collostrum count within range we want. Baby named JuBellation! One of the reasons I moved to the Willamette Valley of central Oregon was to be near Oregon State University's (OSU) Veterinary Hospital. It has one of the premier Camelid vet schools. Moving to Creswell, I would be near the latest studies and I figured there would be good vets in the area knowledgeable on alpaca care. You always hope for no emergencies but if there is one, being near a vet hospital like OSU would be a godsend. On a cool June morning, I went out to the barn like I always do to open the gates to the big pastures and let the alpacas out when I noticed Sprite not getting up. I thought she might not be feeling well the way she was laying there so I walked up to her. She got up and it was obvious immediately that she had somehow broken her leg. I called my vet and my nearest alpaca neighbor for assistance. My vet said I should get her up to OSU right away and he would call in the referral. He talked me through how to splint her leg and Ann came over to assist me in doing that and getting Sprite into my car. Fortunately, my Honda Element lends itself so easily in hauling alpacas. We gingerly got her in the car and rushed her the hour to OSU. The leg required a plate and surgery to repair the fracture. Their skill, knowledge and state of the art equipment not only saved Sprite's leg but her life. She remained at OSU for about a week while they made sure healing went correctly. She did really well and came home for the remaining part of her recuperation. It was two months of having to be in a small pen while her leg healed. Sprite had just had her first birthday and being young and used to running in big pastures was hard to keep her in a small pen. She was bored stiff and not happy being confined. I would go out as often as I could and offer carrots and visit with her. Because of the handling she got, she was rather skittish of me and she had been just coming around before her accident in becoming quite social. But with every time we handled her being so painful, it was no wonder she didn't want much to do with any human. I tried to just sit outside her pen for awhile and offer carrots or other goodies without doing anything else to her. I would take a book and my lunch sometimes and read out loud to her. I enjoyed it even if Sprite didn't. I noticed though she would relax and lay down after a bit. My friend Ann's grand-daughters were visiting her farm for a few days so I had the idea of inviting them over to spend time with Sprite. I thought maybe a child might be more welcome than us adults that seemed to only remind her of pain and suffering. I asked if they would like to come and see Sprite and read to her and give her carrots. Annika thought that would be fun and she came over. We picked out a Shel Silversteen book from my shelf as we both agreed those silly poems were perfect for someone not feeling well. They would lift Sprite's spirits. We took the book and a bag of carrots with us. I placed a stool in Sprite's pen and left Annika and Sprite alone in the pen. Annika has such a way with animals and it didn't take long for Sprite to enjoy her carrots and poetry. It was so sweet watching Annika read to Sprite and after reading a poem making sure she showed Sprite the pictures. A few times I saw Sprite look over Annika's shoulder as if to look at the page and read along with her. Sprite seemed to be quite comfortable with the entire process and they shared carrots both munching away as Annika read aloud. I have found that when I am stuck with socializing an alpaca that having a young child can be the key in breaking through the alpaca's fear and mistrust. A child is more their size and non-threatening. Sprite will come for carrots but she still looks at me with great mistrust. But the afternoon with Annika showed me her willingness and enjoyment of being with a person. This gave me another idea. Wouldn't it be great to invite children that have reading difficulties to visit the alpacas and read to them? 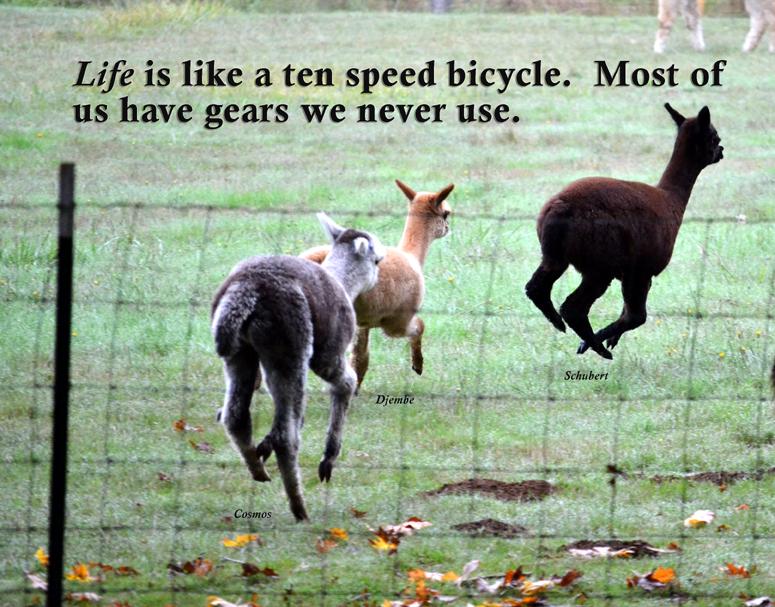 The alpacas don't care if they miss or struggle over words. I bet normally reluctant readers would find it fun and be more enthusiastic to read to an alpaca. The R.E.A.D.S. program does something like this with dogs. Admittedly, dogs are easier to bring to kids but it would be another great avenue to encourage kids who are challenged in that area to do more reading. I'm sure my Great Pyrenees, Moose, would love to be read to if nothing else and he makes a great pillow too! Sounds like a trip to the wonderful library in Creswell is in my future to talk to the folks there about having some of their reading groups come to the farm. How fun will that be! 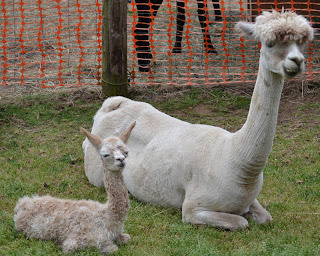 I recently wrote a couple of blogs talking about alpaca therapy and how alpacas can help people with various issues. Someday I would love to work with a psychologist or therapist in designing a therapy program using alpacas. There are many such programs out there using equine therapy as well as small animals such as dogs and cats. Alpacas would be another wonderful modality to offer people. 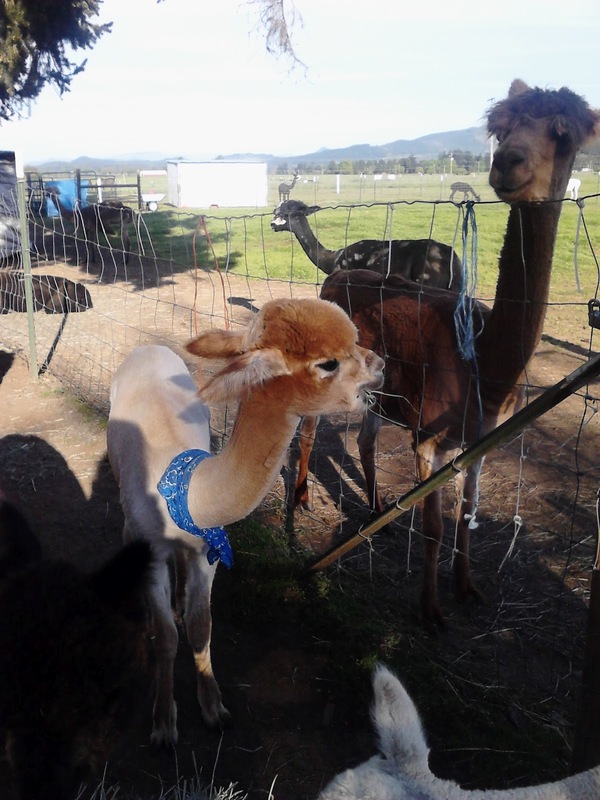 I shared a couple of observations I had with the foster care facility I had invited out to the farm I had been boarding my alpacas. I was giving a farm tour and had a bucket of pellets that the alpacas love so much. I had about 20 kids with me and I was giving my standard talk about alpaca basics. I was letting the kids take handfuls of grain to feed the alpacas. A teenaged girl of about 15 or 16 was enjoying herself from the second she walked onto the farm. She was obviously a big animal lover. Her energy was extremely high but you could tell that it could shift in a heartbeat from being high to in your face anger. She wore her hurt and anger on her sleeve. She was the type that was going to hurt you before you hurt her. I didn't know her story but you could feel her anger and pain coming out her pores. I was thrilled that she was getting some time to let the anger go for a bit while enjoying the animals. This young lady asked if she could take the bucket for a bit because she wanted to feed this one alpaca that was hanging back. I looked at the alpaca she was pointing at and it was Scarlet, one of the most difficult alpacas on the farm. I was concerned because I didn't want her to have a bad experience. I had brought the kids to the alpacas I was sure would give them good responses and engage with them. This alpaca was not only difficult for us humans but she didn't get along with the other alpacas either. If there was a spit fight in that pasture, she was almost guaranteed to be one of the two in the spit fight. I had tried to work with her and get her to take food from me but had never been even close to having any kind of success with her. I told the teenaged girl that Scarlet had not taken food from anyone before but she was welcome to try and I gave her the bucket. I watched for a few moments to see how she was doing and noticed she was square in front of Scarlet. I went over to her and suggested that she turn her body slightly. I told her that if you face an alpaca square like that, they will take it as a confrontation. They read body language and that position is seen as being aggressive. I suggested she try turning her body to more an angle and lower her eyes so she wasn't looking directly at the alpaca. I got asked some questions by the other kids and was busy answering them when in about 5 minutes, this teenaged girl came over to me so excited. She was literally hopping up and down. She told me she did it! She had gotten this animal to eat from her. I was flabbergasted. It took her less than 10 minutes to do what I had tried time after time after time to do. I went over to see it and she wanted me to witness her success as well. Sure enough, this alpaca was eating from her hand like so many of the others do with me. Later after the kids left, I pondered on what I saw and realized that those two were absolutely two peas in a pod. They both would spit at you before you spat at them. They somehow recognized kindred spirits in each other and connected. This was at a farm with over 400 hundred animals on it and she connected with the one animal that was just like her. I had almost steered this girl away from working with that alpaca because I was afraid she would be disappointed if that alpaca treated her like she normally treated me. I had never thought for a million years that a response like that was even possible. What is really cool about alpaca therapy or any other kind of animal therapy is that it doesn't feel like therapy. For kids, it feels like play. I have no idea what diagnosis or treatment plans this young girl was on. But what I do know is that with Scarlet, she got to experience connecting with someone she wanted to reach out to by changing her normal aggressive stance. She didn't take what I suggested to her personally or defensively. It was safe and non-threatening for me to teach her how to connect to this alpaca. She took that advice and tried it. Then she got to experience the success of it. In that single event, this girl got to feel a different way of being with someone else. Did this moment change how she was for the rest of her life? I doubt it but can you imagine if she came regularly to the farm and worked with the alpacas how it could change her dynamics? The latest addition to Hum Sweet Hum is a sweet little girl cria. She was born on Sunday and only 48 hours old. It was a classic birth. My first alpaca I purchased is her mother and she is a pro. With minimal effort required from me, I get to be able to just observe their dynamics. Dulcinea is an attentive mother. The first 24 hours, while the baby was busy exploring her new environment, Dulcie ran after her to make sure she didn't get lost or into too much mischief. This little girl is very active and inquisitive so Dulcie had to keep up with the little one. I kept them in my barn area so it wasn't a huge area to run after the baby. It was a rainy day too so I wanted to keep them near shelters. I haven't had to do much other than put a cria coat on the baby and weigh her. It has been Dulcinea who is doing all the work. I have had the opportunity to just observe Dulcie's parenting. I named the cria Miss Marple. She has markings and coloring that remind me of fudge marble ice cream. She is also so incredibly inquisitive of her surroundings and quite confident for such a new little being. Dulcie, like most dams, hum to their babies so the baby can learn their voice. Each dam has her own unique hum that they sing to their babies. Dulcie started about 24 hours before the baby was born to hum which gets the baby still in the womb to get to know her voice. It is a stead hum for days as the baby learns who mom is. I have several white animals and Miss Marple isn't always sure which white animal is mom. It seems like she thinks that white animal should also provide her milk. The other white alpacas have been quite patient with her nudging her gently away or dancing away. She keeps trying to get to the milk bar but none are cooperating with her. Only one have I seen get irritated with her and spit at her. I noticed it wasn't a loaded spit though but air. There was no green on the baby. So it was a warning shot. The first 24 hours, Dulcie stayed within feet of the baby even if she was running about checking things out and testing her legs. The next morning, Dulcie let the baby have a bit more freedom to explore without running after her. Dulcie was busy eating some hay and goodies I had given her when the baby got into some mischief. I could see her following another white female and I could tell she was thinking that was Dulcie. I called to Dulcie to come get her baby because they were heading out into the big field. I could see Dulcie watching but I wasn't sure if she saw that they were heading out all the way into the big field. When I called Dulcie's name, she came running when I told her to come get her baby. I could see the surprised look on Miss Marple's face as she saw mom coming to her and it was really quite cute when she looked up at the face of the female she had been walking with. It looked as if she was wondering how mom could be in two places. Mom is standing next to her AND running to her? She didn't seem bothered by the confusion and simply followed the one that was humming at her. Later in the afternoon, Dulcie was teaching Miss Marple how to find her without Dulcie chasing her down. She was watching her from the shelter and hay bin but she let Miss Marple run around a bit and then try and figure out where mom was. I could hear Dulcie humming to the baby but she waited to see if Miss Marple could figure out where she was. The day before or earlier that morning, Dulcie would have run after Miss Marple but this lesson was teaching the baby to find mom on her own. She went up to several white animals and got the message that they were not mom. She wasn't afraid but seemed to be having fun looking around. She checked out a lot of the barn area and then she got into the right spot to spy mom and I could see her body language change and she trotted over to mom and snuffled her side. Mom bent down and sniffed her tush and gently pushed her towards the milk source. Miss Marple had a little drink and laid down tired after her big exploration. I was so impressed with Dulcie and how she is parenting this little girl. She watches her like a hawk but is not so overly protective that she is making the baby fearful of her environment. On the contrary. Dulcie has been giving the baby lessons that it is ok to go out and run a little and play but come when called and she is teaching her how to find mommy on her own. It's going to be fun watching their dynamics and how Dulcie teaches Miss Marple the ways of alpacas and being a member of the herd at Hum Sweet Hum. 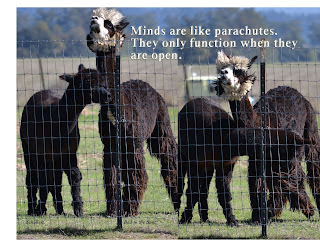 In my last blog, I talked about trauma and how being around alpacas can help people who suffer from the effects of traumatic events in their lives. I invited a foster care organization to the farm. It was a live-in foster care facility and the coordinator was looking for activities that would be good to bring about 20 kids to for an outing. She was eager to accept my invitation and we set a date. The kids got out of their vans and were quite hyped up. I talked to them briefly about gates and keeping them closed and then told them the best way to interact with alpacas. Fast movements and loud noises would startle the alpacas. I wasn't sure how much was heard but alpacas are clever enough and can move fast if they need to run away. I hoped the alpacas wouldn't be too frightened by the hyper-activity and would interact but one never knows. I had a bucket of pellets to hand out to kids and hoped that would overcome any fear the alpacas might have of the large number of people coming to see them. A few kids took to the alpacas right away and enjoyed giving treats. As first, I took them to my most social animals I'd worked with so as to set them up as best I could for successes. These kids needed whatever successes they could get. The ages of kids ranged from around 8 or 9 to around 15 or 16. Two teenaged boys were trying to act "cool." One kid was uncomfortable with wanting to enjoy himself and appeared to be the leader of the other boy even though the meeker boy was double the size. He went along at first with the one kid that wanted to make fun of the entire situation and also wanted to be center of attention. I took them to a pen that had a couple of more skittish alpacas. I wasn't sure why I did that but I tend to follow my instincts. I asked the larger kid if he wanted to try feeding one of the younger and skittish alpacas. The boy took some treats but the alpaca was a little too afraid of this big kid. I suggested he bend down a little. He did so and the alpaca was more curious and wanted some pellets so overcame its fear and took pellets. I watched as this big kid who was following the lead of the mischief maker was now ignoring the antics of the other kid and focused his attention on this alpaca. His energy softened and this large kid became this gentle soul talking so softly to this alpaca. I wear a treat pouch at events like this so I have treats at the ready as well as have both hands handy. This big kid asked me if he could borrow my pouch while I helped with some of other kids. I smiled and handed him my pouch. The mischief maker started to tease the big kid about wearing my pouch and the big kid told him to "shut up" and turned his back focusing on his alpaca. Without coaching or interference on my part, I observed this big kid who was initially going along with the peer pressure and leadership of a kid who wanted to cause trouble quickly change to being a gentle and caring guy and he walked away from the peer pressure. Just a little positive reinforcement with encouraging this kid to feed this little alpaca and he was able to choose for himself what he wanted to do and not follow the cycle of negative influences of peer pressure at least for a couple of hours. I did notice that the mischief maker gave up on the larger boy who was now totally into the alpacas and turned his attention on a younger child. This young boy was a different kid than the rest. You could tell he was teased a lot and probably bullied. The mischief maker kid was definitely more cruel with his "teasing" of the younger boy. The young boy found an alpaca he wanted to interact with. My heart sank a bit because he chose a very aloof alpaca. She didn't interact much with the herd and she never came over for pellets. She was difficult to halter train and just didn't like people or alpacas for that matter. The young boy asked for some pellets to offer this little alpaca so I gave him some. There were other alpacas that were very interested in the treats and I hoped perhaps he'd be interested in them but he was totally focused on this aloof alpaca. We were in a catch pen of about 15'X15' so she couldn't go far to run away. I got asked some questions by some of the other kids and after a few minutes, this young boy came over to me and asked if I could help him. The teasing started in again with the mischief maker and I stepped in and walked the younger boy away offering to help him. He asked me if I could distract one of the other younger alpacas that kept interfering with him and his desire to connect to "his" alpaca. I shooed the other alpaca away and he sat on the ground. I kept the others away while he interacted with this alpaca and got talking to some of the others again. The next time I looked back to see how this boy was doing with "his" alpaca, I smiled as she was taking treats from him and their foreheads were touching in such a sweet fashion. He had connected with her and she with him. They were in a corner of the pen and for the two of them, no one else was around. They were so connected. The other boy attempted to tease again and I interrupted and started to praise this young boy for doing something I had tried for months to do and wasn't successful at. This young boys face lit up with the praise and the taunting and teasing of the other kid fell on deaf ears. It was sad that the mischief maker couldn't or wouldn't let his guard down but what was very interesting was that all the others that would normally follow his lead chose not to and the ones that he would taunt and be mean to ignored him as well. The hold he typically held over the other kids was quite diluted while at least on the farm and around the animals. The alpacas were able to defuse and undo his hold. He increased his antics as their time wore on but it didn't have any affect. You could tell he was very unsettled by the loss of control he had over the others. This all happened plus more in about two hours at the farm. Can you imagine what healing could take place if troubled kids could spend more time with alpacas? Alpacas and animals are wonderful healers. (I have not included pictures of that event to protect the children that were present). I came to alpacas in my mid-40's. I had a couple of other careers and when I got into alpacas, people thought (including myself) that it was such a different thing to do than what my career choices had been. I worked for nearly 20 years as an engineer for the Navy and then received my Master's Degree in Counseling Psychology with an emphasis in Depth Psychology. Two careers that seemed quite different from each other and then to become an alpaca farmer is yet another crazy direction. But as I have worked on my alpaca business and the more I'm around these animals, I am seeing how those previous career backgrounds are used regularly. The skills I had in project management and problem solving are so useful that I obtained from my engineering background. The area that I find the connection most intriguing is with my psychology background. I'm amazed how many people that have suffered a traumatic experience(s) are drawn to alpacas. There seems to be such a kindred spirit between the traumatized person and alpaca. It makes sense that there is a healing connection between a traumatized person and animals such as alpacas. The area of the brain that deals with the flight or fight response is very similar in all mammals including humans. In a threatening situation, there are three means of response to the threat. Most know of the flight or fight response. We either run from the threat or turn and fight. The third response is less known and it is when one becomes immobile or frozen in the moment of threat. This is a physiological response. When faced with an overwhelming threat, this "immobile" response can be a last ditch effort to survive. It is commonly known as playing possum. The animal or person "plays dead." In the wild, an animal will go into this immobile state and perhaps the prey animal will drag it away from other predators so not to share it. If lucky, the prey animal will get an instant that it can escape at which time, the chemical that puts the animal into this possum state will instantly wear off and the ability to run is engaged. The other reason for this immobility response is to put the body in an altered state so it doesn't feel the pain of imminent death. Peter Levine talks about this in his book "Waking the Tiger: Healing Trauma." He discusses how we can learn much about trauma and healing it by observing animals in the wild. Our society sees that reaction of freezing in the face of danger as a weakness. When it occurs, we consciously and unconsciously judge ourselves for being weak. Experiencing that freezing state goes beyond that judgement piece though. That freezing moment is related to our fear of death. Our desire is to avoid death and our fear of it at all costs and that is normal and understandable but it is that avoidance that causes future difficulties sometimes lingering debilitating issues. How we are able to come in and out of that frozen state is an important role in whether we suffer long term traumatic effects. If we stay frozen, that is when Post Traumatic Stress issues come into play. Being with flight animals such as alpacas who go in and out of those three threat responses models for individuals who are suffering from trauma. It can help teach them to move through those areas that they find themselves stuck. An additional benefit to alpaca therapy is that they are so darn cute. You are guaranteed a smile or laugh being around these creatures and their antics. When we smile and laugh endorphins are released. It is the body's natural anti-depressant. I know personally that if I am in a down mood and funk, going out and being with my alpacas lifts my spirits. It's day two of weaning Djembe. The first day, Djembe seemed to handle it fairly well. He ran the fence line a number of times and then went off with his herd and grazed. He repeated that cycle throughout the day but seemed to be doing better than many others that I have weaned. On day two, however, his anxiety went up and he was running the fence-line in a panic and trying to break through my gates to get to his mom. I offered him pellets to see if that would distract him. He ate a few mouthfuls and then ran back to the fence to see if he could get through the gate's slats. I thought I would try the Essential Oils that I used during shearing to see if that would help calm him down. I went into the house and got one of my spare bandanas which I've been using to help identify my pregnant dams that are imminently due. I put a drop of the Peace and Calm oil on one side of the bandana and Stress Away on the other. Djembe comes readily to me now and eats a few pellets from my hand. He also lets me hold him calmly. I put the bandana on him and observed his behavior. He was walking around in the cria submissive position with his tail up and neck shrunk into his shoulders. Djembe went back to the far area of my pasture where he can still see his mom. Within 2 minutes, he stopped walking around in the cria pose and no more racing about. He started grazing and although humming and watching for his mom, he calmed way down. He is still anxious and not happy but he is observably calmer. I'd like to see him with his herdmates more but at least he isn't running in a panic. The oils appear to have taken his energy and emotions down a notch. No cure-all but definitely an improvement. 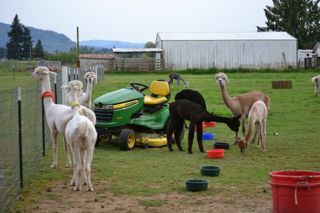 Shearing is complete for another year for Alpacas At Hum Sweet Hum. In an earlier blog, I talked about experimenting with essential oils to calm the alpacas during their stressful day. I put a dab on the palms of my hands of Peace and Calm oil and if an alpaca was extremely frightened would let them take a whiff of my hand. I also put some on rags as well as some volunteers so when the alpacas were being sheared on the ground and looking overly stressed, we'd lightly place the rag over their faces or near their noses. The oils appeared to work on some alpacas better than others. Alexis is one of my new girls on the farm and more skittish. When haltering her, she was pretty high strung and then she took a few whiffs of the oils and she didn't care at all what was going on. The essential oils made a noticeable difference in her demeanor and she laid there about as calm as I have seen with an alpaca. Misty also was calmed dramatically with the oils. She normally would have fussed more. She was extremely zenned out when I experimented with the oils a few days prior to shearing. It was really quite hilarious to observe her looking almost stoned. She is my piggiest alpaca where food is concerned and after taking a few whiffs of the Peace and Calm oil, she was letting all the others go to the pellets and treats. During shearing, I was struck at how calm she was about being picked up to be laid down to the ground for her shearing. She is a big girl and can be a handful when she is so inclined yet she acted like they could pick her up and carry her anywhere they wanted. She didn't scream, spit, or pee at all but laid there like she was getting a massage. However, there were other alpacas that I saw no signs that the oils did anything for them. Windsong who when pregnant is a crazy thing when handled. She will come for carrots and treats but try and handle her and she alarms. When not pregnant, Windsong will wrap herself around you to get a full body massage. Her behavior suffers a dramatic change when pregnant. I don't even need to spit tests or have ultrasounds on her to confirm pregnancy. Her behavior is an easy indicator. We used the Essential Oils on her and she still spat and alarmed. She did somewhat calm after the shearing started but not sure if that was due to the oils or she just gave up. She was highly stressed until I took her halter off in her pasture away from the hullabaloo going on in the barn area. The one the oils did work on was me! Shearing day is one of my most stressful days on the farm. It's a lot on my shoulders to keep track of and running from one station to another answering questions of volunteers and filling in a spot that needs someone to work and just make sure everything gets done that is required. It's a long full day of having to stay focused. Once the routine of shearing gets going, I calm down more but in the beginning, I feel my stress more and work hard to keep it under check so the alpacas don't pick up my anxiety. I would take whiffs from my own palms when I felt my anxiety pick up and I could feel my body relax. I have only a single day of use so not a huge amount of data to judge with but I would and will use the Essential Oils again and knowing which animals that definitely calm down with its usage is good information for me. If others use it during shearing, I'd love to hear how it works for you.